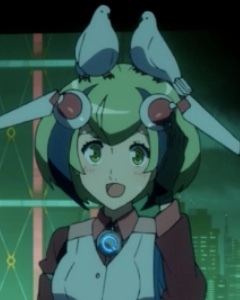 In “Loser,” Dimension W’s second episode, Mira shows how well she can handle herself on a mission and Mabuchi learns something about numbered coils. If you’re interested in reading the books, Amazon has a whole collection of them here! Mira receives her first work uniform for Mary. Mabuchi doesn’t answer when Mira asks if he thinks she’s cute. Capture from the Funimation stream. Kyōma Mabuchi and his new assistant, Mira Yurizaki, arrive at the museum where a mysterious figure named Loser announced he intends to steal a display piece. Since Loser has never succeeded in actually stealing anything, Mira wonders why they’re bothering with him. Mabuchi tells her that where there’s powerful and illegal communications equipment like Loser’s using, there’s probably illegal coils. A crowd has gathered because of Loser’s publicity. He arrives amid fireworks containing communications-jamming confetti. Mabuchi tells Mira to find the communications hijacking equipment as he tries to confront Loser, who disappeared into the museum. As Loser evades the security systems, Mabuchi keeps up with him until they reach a hall with armored defending robots. The robots interpret both of them as intruders, so after conforming that Loser won’t hand over the illegal coils, Mabuchi decides the two should combine forces to neutralize the robots. As the fight wraps up, Mira realizes she needs to get away from the chaff that had been in the fireworks so her sensors will work. Loser reveals that he and <> served in the same anti-coil unit. Loser paid a considerable price. Capture from the Funimation stream. After the fight, Loser tells Mabuchi that the collector had been in Grendel, a specialist military unit confronting coils with just flesh and blood. How does Loser know? He had been in the same unit. He had also witnessed the “accident” that New Tesla had engineered to kill all of them. The “accident” cost Loser his arms, legs, and wife — his face was terribly scared. Loser’s in this for revenge. The police interrupt them. Loser uses a smoke bomb to escape, and the police are about to apprehend Mabuchi when a steel door closes. The museum curator decided to lock the police out because there’s something he doesn’t want them to learn. Loser begins to get an idea of what that might be when he arrives at the display. He finds something called a numbered coil inside. Before he can extract it, two robots with illegal coils attack him. Mabuchi arrives to disrupt the attack. When he points out that the robots’ coils are not only illegal but are among the most illegal, the curator panics and orders the robots to kill both of them. Mabuchi makes quick work of them by driving his wired knives into their coils. As Mabuchi investigates the fallen robots, Loser retrieves the numbered coil from the artwork. The police arrive outside the closed doors, and fearing discovery, the curator attempts to remove the illegal coils from his robots. That’s a terrible mistake. He doesn’t have the expertise, and he triggers an trans-dimensional meltdown. Loser escapes and leaves Mabuchi to deal with the catastrophe. Mabuchi tries to save the curator, but can’t. When the dimensional collapse finally stops, it leaves behind a scene that could have come out of a Lovecraft novel — twisted remains of the two robots repeated dozens of times in dozens of distortions, along with similar warped presentations of the curator, who is still alive and terrified. Albert Schumann arrives with a team from New Tesla Energy to take control of the scene. To them, it’s just another class C incident that they’ll clean up and hide from the public. I like the way Mira’s antenna seem to move almost unconsciously whenever she’s excited or panicked. In a flashback, Mira told Mabuchi, Mary, and Koorogi that her father was dead and her mother and older sister had been murdered. That scene in enough was affective and dramatic; but to show everyone the recording she had made, she effortlessly hacked into the room’s systems. It seemed natural to her. I like how powerful she is. Mary was smart enough to recognize the dangers surrounding the girl robot Mabuchi had brought into their midst. Capture from the Funimation stream. In that same scene, Mary showed her political astuteness when she announced she’s decided to employ Mira. It wasn’t a compassionate decision; it was a practical one. If someone from New Energy Tesla captured Mira and discovered that she had witnessed her mother and sister’s murder, they’d trace her associations back to Mabuchi and Mary and kill them all. Mary could easily have become a unidimensional background character. Instead, she gets to show her smarts and make good decisions. Mira had not idea how to find the communications hijacking equipment, and Mabuchi left to confront Loser without telling her. Instead of giving up or moping about his brusque treatment, she uses her skill and intelligence to figure it out. She’s really good at it, too! I like her resourcefulness. I guess her antenna kinda look like hair pins. Capture from the Funimation stream. When Loser’s son confronts Mira about her antenna, she says they’re hairpins. Quick thinking, even if it’s not particularly convincing. 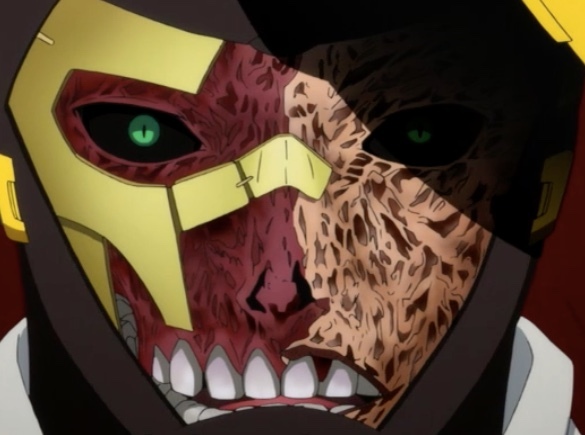 The animation of the dimensional collapse looked appropriately creepy and disturbing. It reminded me a lot of some scenes from Lovecraft’s short stories and novels. As Mabuchi evades the dimensional collapse and has to abandon the curator, he calls out, “Please don’t think badly of me!” He tried to save the curator, but the curator was too busy freaking out. Nothing stuck out as negative to me. I enjoyed watching this episode. 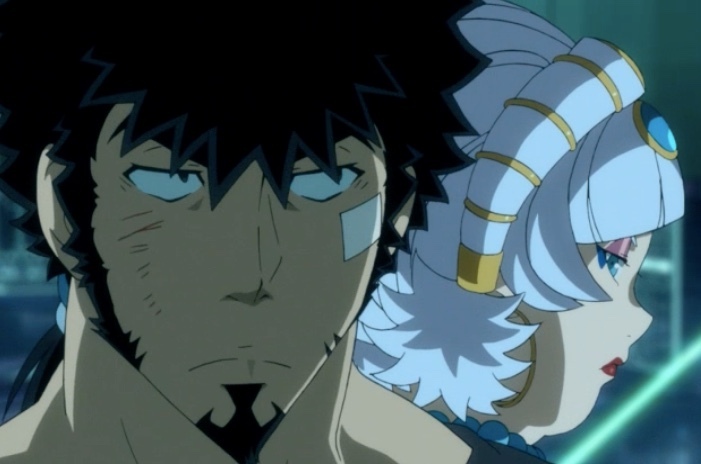 Dimension W presented us with some tantalizing clues both about its main characters and about the energy source from dimension W. We found out that Mabuchi was part of a highly trained military unit responsible for opposing military use of coils. We also learned that New Tesla Energy even back then had enough influence to destroy that unit. Now, in the story’s present, the company has the power to cover up not only Mira’s father’s death, but events like dimensional collapses, which appear to be routine. These revelations begin to sharpen questions like what was Mira’s father willing to die for? 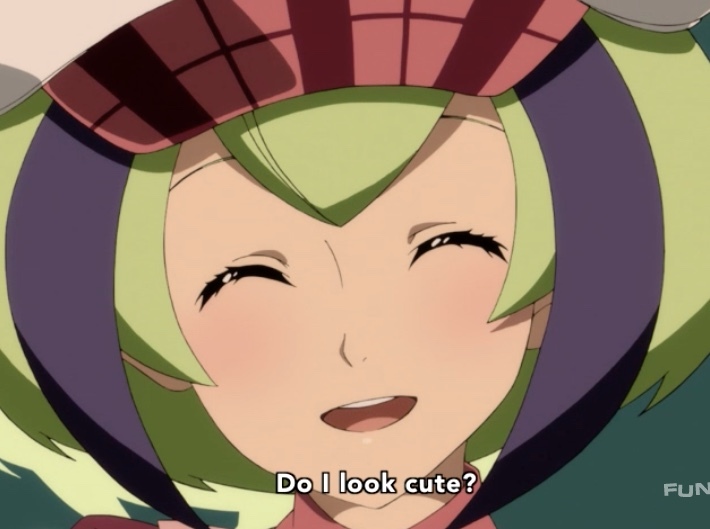 What danger does dimension W’s energy present? Could a dimensional collapse happen on a larger scale — say, on the scale of a city, continent, or planet? Most pressing of all — are Mira’s “hairpins” antenna? Sensors? What? Waiting for next week to find out.